Sallie Ward Lawrence Hunt Armstrong Downs, to give her her full array of names, was one of the most famous of the antebellum belles, the prototype of a beauty that, a generation later, would be captured by the still and then the moving picture camera. Her portrait, by George Peter Alexander Healy, shows a queenly sort of beauty, a matron, the mother of children. Pausing to note the attributes Mrs. Ellet bestows on Mrs. Downs – “a pet kitten,” “a farmer … in possession of a young lamb or heifer” – the features of her biography as an adult suggest a different model, one in the mold of the headstrong Katie Scarlett O’Hara Hamilton Kennedy Butler. 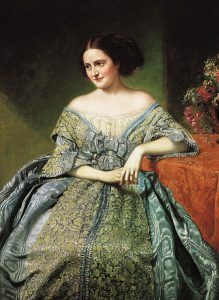 For her first appearance on the national stage, in 1848, Sallie Ward spurned the beaux of Louisville, Kentucky, to marry the eligible young Timothy Bigelow Lawrence of Boston. (He was not, as an early biographer suggested, “many years her senior”; nor was Mrs. Bigelow Lawrence eighteen years old. The pair were 22 and 21, respectively.) Sallie Lawrence found Boston stifling; the prosperous Lawrence family – her father-in-law would become the U.S. Minister to Great Britain in 1849 – found her somewhat uncanny. Her third marriage, to “Vennie” Armstrong, was brief; her fourth, to Major George F. Downs, lasted until her death. Her will left nothing to Major Downs, with the bulk of her estate going to her only surviving son – perhaps a verdict on her last husband, who appeared in court to attest his wife’s probate. Elizabeth Fries Ellet, The Queens of American Society (New York: Charles Scribner & Company, 1867), 229–30. She married Timothy Bigelow Lawrence in 1848, Dr. Robert Pearson Hunt in 1851, Venerando Politza Armstrong in 1876, and George F. Downs in 1885. Ella Hutchison Ellwanger, “Mrs. Sallie Ward Downs,” Register of the Kentucky State Historical Society 16 : 11. The New York Times, 20 July 1867. Kentucky, Wills and Probate Records, 1774–1989 [database on-line]. Thomas D. Clark, “Sallie Ward,” in John E. Kleber, The Encyclopedia of Louisville (Lexington: University Press of Kentucky, 2001), 921.